Four people have been seriously injured in a collision on a roller coaster ride at Alton Towers in Staffordshire according to reports. The seriously injured are reported to have leg injuries. They are all thought to be teenagers. 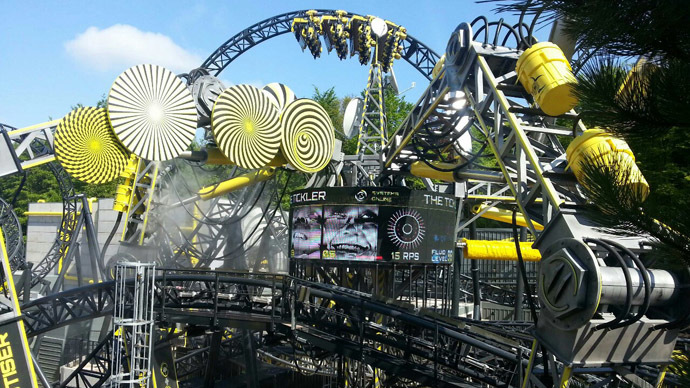 Two carriages crashed into each other on the Smiler ride on Tuesday afternoon. Sixteen people were on one carriage while the other was empty, reports indicate. Staff are currently evacuating the area and an air ambulance has landed in the area of the incident. A platform is being constructed to help evacuate riders. One Twitter user contacted RT to say they heard passengers screaming from distress or pain. Another visitor to the theme told Sky News The Smiler had broken down three hours earlier. At Alton towers just witnessed a car on smiler crash into another one; feel sick like something out of Final Destination! In a statement, West Midlands Ambulance Service said it received a call from the resort at 14.09 BST reporting that a carriage of The Smiler crashed into a stationary carriage. Community first responders based at the theme park were first on scene, they said. Four ambulances, an air ambulance with a trauma doctor on board, two doctors and several senior paramedics have been sent to the scene. A spokesperson for the ambulance service said: “There are 16 patients on board The Smiler requiring triage, four of which have reported serious injuries. “To ensure the safe and timely evacuation of guests, a platform is being constructed. This will take a few minutes but will enable us to proceed more quickly. There will be a full investigation once we have recovered the guests, who are our priority,” the theme park added. The Smiler first opened in May 2013 and holds the world record for most inversions – a feature of the track which turns riders upside-down and then rights them. The launch of the ride was delayed due to technical issues encountered during testing. A ride incident during The Smiler’s preview event on May 22, 2013, saw riders stranded for around 30 minutes. The group of sixteen journalists were left dangling at a steep angle after going round the first loop. The Smiler finally opened on May 31, roughly two months behind schedule. Since opening the ride has experienced a number of minor incidents, including one in November 2013 which resulted in injuries.